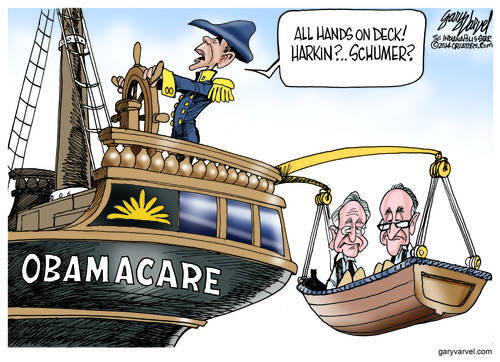 As the cliche goes, “The rats are leaving the sinking ship.” There is no clearer way to see than than than by listening to outgoing Senate Majority Leader Harry Reid’s criticism of Obamacare. Senator Reid has become the second high-ranking Democrat to sound off about the law they forced through congress over Republican objections. Rather than leading, Reid was following on after similar words from Senator Chuck Schumer of New York. The midterm elections gave Democrats a real thumping, and now surviving Democratic Party lawmakers are looking to the future of their own careers, not to loyalty for Obama, and not specifically for what is best for Americans. These turncoats must see their newly minted criticism of the awful mess of Obamacare as their anchor of safety in an increasingly hostile electorate. Reid’s regrets about various aspects of Obamacare must rank as one of the major understatements of 2014. Senator Reid was clearly forming his words for Nevada voters, who will be the ones to decide if he is to be re-elected in 2016. His crocodile tears were flooding out as he reiterated his “disappointment” to a Politico reporter. It is as though the puppet strings that Obama had connected to the Democrats have been cut, and they can finally stop mouthing the Obama administration talking points. As was shown in a recent Varvel cartoon, Obama is oblivious to the noise of mutiny from top leaders in his own party trying to salvage their own political skins. In his interview with the Times, Reid said, “We never recovered from the Obamacare rollout. I’m not going to beat up on Obama. The roll-out didn’t go well. We never recovered from that.” He added that he has “no regrets” about moving the Affordable Care Act (ACA) ahead of other issues. Nice words meant only for the president don’t erase the fact that 19 Democrats who voted for Obamacare four years ago have retired or resigned from office, according to a report by Bloomberg Politics. Senator Reid’s remarks were preceded by the news of his probable replacement as Senate Minority Leader if he fails to be re-elected by his Nevada constituents in 2016. Whatever their motives are today, Democrats appear to be waking up to the negative opinions more than half of voters have toward Obamacare. A Rasmussen Reports national poll released on Monday found that 44 percent of likely voters hold a favorable opinion of the healthcare law, while 52 percent view it negatively. The political imperative in Washington these days for Democrats is to duck for cover and run as far away from Obamacare and the Obama Administration as possible. Obviously, now their damage is done, they are worried more about their political lives than anything else.